Suspended Animation, Inc. (SA) is a cryopreservation research company based in Boynton Beach, Florida. Cryonics Institute (CI) Members who reside in the continental United States can obtain Standby and Transport from Suspended Animation through a special purpose local help rider to the Cryonic Suspension Agreement. SA is an option offered to CI Members, but CI neither endorses nor opposes the use of SA. Some CI Members utilize SA, and others do not, and opinions differ regarding the advantages or disadvantages of SA's services. You should make your own investigation and decision regarding the use of SA. Information can be obtained below and from the SA website. 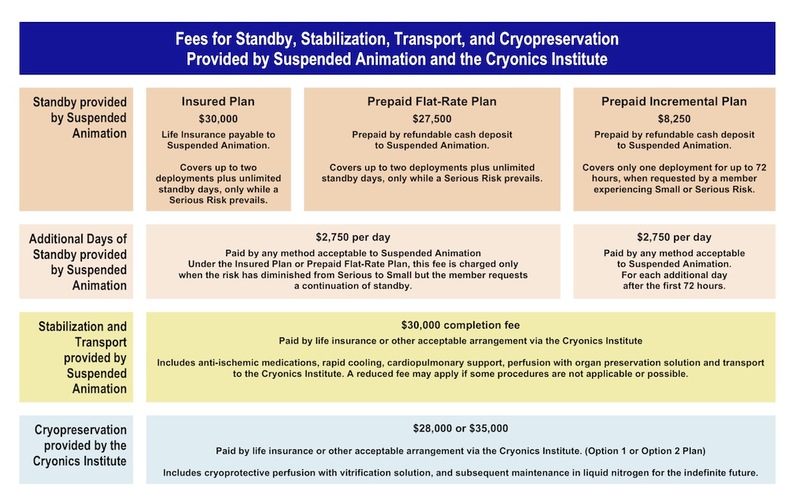 The Cryonics Institute has successfully concluded negotiations for a contract to offer Standby and Transport assistance from the Florida cryopreservation research company Suspended Animation, Inc. CI Members who wish to receive these services must provide additional funding, part of which can be through life insurance. "Standby" refers to a team of fully-equipped cryopreservation employees waiting by the bedside of a cryonics patient close to legal death or at risk of legal death. If the cryonics patient deanimates and is pronounced legally dead by a physician or qualified nurse, then the Standby team will immediately attempt to begin the application of cryonics stabilization procedures, including ice-bath cooling and the use of a heart-lung device. "Transport" includes moving the cryonics patient from the location where death was pronounced to the CI Facility in Michigan. During Transport the Suspended Animation team will attempt to continue to apply procedures intended to prevent damage to tissues, particularly the brain. These procedures will include blood washout and may include cryoprotectant perfusion (depending upon whether the patient wishes CI or Suspended Animation to do the final perfusion). The normal funding mechanism for CI Members is to have a basic fee for perfusion, cool- down and long-term storage -- currently $28,000 Option One and $35,000 Option Two. Additionally, for Members not living in the Michigan area CI has a Local Help Rider to pay for services of a remote funeral director, which may include heparinization, some CPR, packing in ice and transport to Michigan. For the Local Help Rider CI Members are expected to allocate additional funding -- up to $5,000 in the US and up to $15,000 overseas. This can be included in their insurance or in prepayment. The Suspended Animation agreement is simply an extension of the Local Help Rider. The SA Rider not only provides for payment for a remote funeral director (whom Suspended Animation would work-with and pay), but for post-mortem standby and transport. Formally, the new agreement is not much different from the usual Local Help Rider except that the protocol is more extensive, the price is higher and the Rider would be (initially) restricted to US Members. Insurance funding is currently only available for procedures that Suspended Animation performs after pronouncement of death. Pre-mortem Standby must be funded through pre-payment or a special bank account. CI Members interested in Suspended Animation Standby should examine the information available on the CI Website: Click Here Further information may be obtained on the SA website and below. The Cryonics Institute has an agreement (contract) with Suspended Animation entitled Cryopreservation Agreement between the Cryonics Institute and Suspended Animation. This agreement specifies obligations between SA and CI under which the SA procedures are offered to CI Members. The agreement is to be renewed automatically on a yearly basis unless adjustments are to be made before renewal. This agreement is essential for Suspended Animation Local Help Rider and the Individual Agreement Regarding Standby for a Cryonics Institute Member by Suspended Animation to be valid, but cancellation of the Cryopreservation Agreement between the Cryonics Institute and Suspended Animation is not anticipated. If not-renewal did occur, there would be notification 30 days prior to the April 21 renewal date and SA-Affiliated CI Members would be informed immediately. There are two attachments to the Cryopreservation Agreement between the Cryonics Institute and Suspended Animation. Attachment 1 is Certification of Completion of Standby Performed for the Cryonics Institute by Suspended Animation. This document between SA and CI would normally be of only marginal interest to SA-Affiliated CI Members. Attachment 2, Schedule of Fees for Standby Provided for the Cryonics Institute by Suspended Animation however, is of much greater concern. The Fee Schedule is also to be revised annually. But fees applicable to any individual SA-Affiliated CI Members will always be valid for one year. For example, if a SA-Affiliated CI Member completes arrangements in August and a new Fee Schedule is announced the following April, the SA-Affiliated CI Member's fees will not change until his/her annual renewal date in August, at the time when the annual readiness fee payment is due. Readiness fees are to be paid to CI, although the SA-Affiliated CI Members should deal directly with SA concerning health status changes and pre-mortem Standby funding. No change of fees will be made prior to the year 2010. Pre-mortem Standby funding can be pre-paid directly to SA or arrangements made with SA for a special Deployment bank account. Beginning in 2006 insurance can also be used to pay for the pre-mortem Standby procedures in addition to all of post-mortem procedures. CI must be the owner of insurance policies used by SA-Affiliated CI Members, but CI will relinquish insurance policy ownership if a CI Member discontinues SA-Affiliated status. As CI gains experience with its relationship with Standby and Suspended Animation, it is possible that insurance funding may pay for some Standby costs under some circumstances in the future, even though this is not the case in the present. In certain cases, depending on logistical factors, two of these separate roles may be combined in one person. If SA accepts a case for less than the minimum funding required for a client, SA may deploy fewer people and modify protocol to reflect these circumstances. Prior to legal death, if sufficient warning has been received and other circumstances permit, Suspended Animation will deploy the team leader, the medical professional, the additional team member, and the scribe to the patient's bedside, where they shall set up equipment necessary to perform the tasks described below. During the waiting period, at least two team members shall be awake and ready to act at all times, while the remaining team members shall be at a nearby location from which they can be summoned promptly. Cardiopulmonary support using a mechanical device and ventilations through a patent and secure airway, enhanced by the use of a respiratory impedance valve. If the team is unable to provide cardiopulmonary support within a short time after cardiac arrest, ventilation of the lungs may be omitted. Induction of hypothermia by packing the patient in ice inside a portable ice bath and active ice water circulation by a submersible pump. Additional measures, such as cold liquid lavage, may be used if this is considered advantageous. Pharmacologic support to modulate blood clotting, restore blood volume and blood pressure, prevent edema, and protect the brain from ischemic injury. If blood substitution of the patient is recommended, the patient's blood is washed out and substituted with the organ preservation solution MHP-2 in either the transport vehicle or a cooperating funeral home (or other suitable location). Surgical access to the circulatory system and cannulation of the vessels is performed by a standby team member skilled in surgical procedures using sterile technique. The patient's blood is washed out and replaced with sterile MHP-2 using a sterile air transportable perfusion circuit. The patient is further cooled by running ice cold water through the heat exchanger of the perfusion circuit. After a target temperature ~ 5 degrees Celsius has been achieved, the patient is packed in ice and placed in an insulated shipping container. They are then shipped via the fastest and most reliable method to the patient's cryonics organization for cryoprotective perfusion and long term care. During transport, one temperature data logger records the temperature of the patient. During all procedures a dedicated scribe takes notes, voice recordings are made and the case is documented using photography and video (optional). Practical and medical circumstances may prevent Suspended Animation from performing all procedures as outlined.